Eminently readable, ruthless, mind-changing, this unique look at what makes house home rewards the closest of scrutiny. 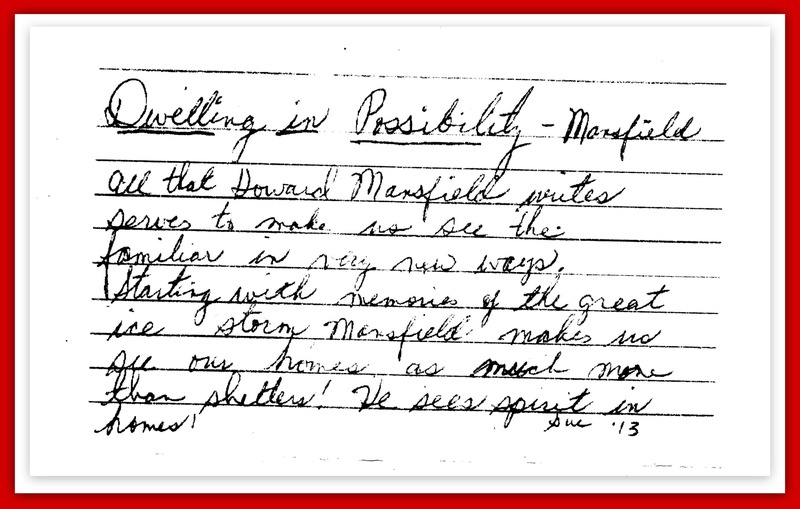 Howard Mansfield is a graceful writer with deep-rooted curiosity and a free-range mind. Reading him is like taking a long walk with a learned friend. In Dwelling in Possibility , Mansfield invites us to travel across time, geography and culture before delivering us—wiser and more thoughtful—to the full-of-meaning place we call home. This wise and witty meditation on what makes a house a home fascinated, challenged, and tickled me. After reading it (and believe me, you should read it), you will look at your surroundings–and, perhaps, yourself–in a richer, more nuanced way. The most astonishing feature of this book is its politically charged center. Between chapters on relatively benign subjects that make us reflective and help us laugh at ourselves, are three powerful sections on “de-housing,” specifically, our nation’s efforts to deprive our enemies in World War II of their secure homes, to set them into the streets, “to break the spirits of the people.” He writes about our bombs that won the war and left tens of thousands of families homeless. Then, when these ruined towns were rebuilt, they were stripped of meaning by Modernism, made by and for machines; and rampant technology eliminated our sense of time. I was only halfway through this book when I began to quote from it. It is strong stuff and goes deep. It should be on every thoughtful citizen’s “must read” list. But the book, for all its upholding of tradition and skepticism about our current habits of life, is not a jeremiad. “I don’t want to be the Judge Judy of houses,” the author told me in a recent phone conversation. Nor is Mansfield antimodern, as he demonstrates in his eye-opening account of Frank Lloyd Wright’s Zimmerman House in Manchester, N.H. The owners, who felt as if they were privileged to live in a great work of art, loved the place. But others assumed they were miserable. Americans, whose idea of dwelling features a lot of forward and upward momentum, don’t trust a house that’s entirely finished, improvement-proof, a done deal precluding expansion. 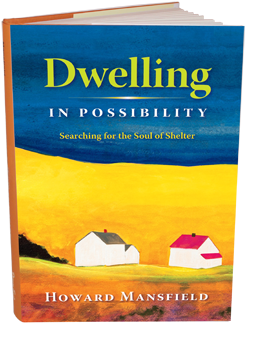 “Dwelling in Possibility” invites the reader to break that momentum for a moment to consider how we dwell in our homes. As Mansfield put it to me, “I’m mostly asking the reader to exhale, live a little deliberately, take a little time and step back and think.” There’s a clutter-clearing quality to his thinking as he sorts through a tangle of impulses associated with our homes — to accumulate goods, trade up, display status, and otherwise pursue what he described to me as “domestic manifest destiny.” It was that tangle of impulses, in fact, that made American homeowners especially vulnerable to the bad deals and skulduggery that pumped up the housing bubble and brought on the resulting crisis. Not since the paragraphs in À La Recherche du Temps Perdu that evoke in their form the plump, inward-turning shape of the petite madeleine have I read anything the form of which so perfectly suggests its contents as Howard Mansfield’s peculiarly moving Dwelling in Possibility: Searching for the Soul of Shelter. Reading the book was as compelling, pleasurable and strange as visiting one of the centuries-old homes of one of my Bucks County, Pennsylvania, relatives: strange twists, hidden spaces, eccentric passions, lapidary phrases one wants to hold and own, curious outbuildings, unexpected depths that suggest “dwelling” can be a sacred occupation – or a sacred space – that how we construct our dwellings makes a cosmic difference in the quality of our personal and communal lives. The structure of this lovely uncanny book does exactly what Mansfield says a dwelling should do – provides space for dreams, silence for imagination, organic development for a sense of possibility and lived-in-ness. … In its form, content and texture, this subtle and quirky book creates a distinct somewhere, a felicitous space, both capacious and snug, hospitable to musing and invention, an invitation to participate in creating a more humane home for us all. Whenever I read Mansfield’s work I come away feeling not only informed, but expanded. His books don’t just sit on the surface of my mind, but enter it, giving me pause, inspiring me to think in new ways and invoking old conceptions, which surface in fresh form. And he does this with grace and humor, which makes it possible to digest the steady flow of ideas without feeling overwhelmed. 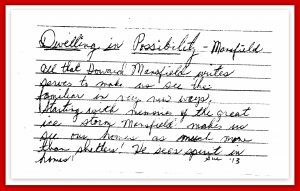 “We are most at home,” Mansfield writes, “when we’re sheltered completely, body and soul.” Dwelling in Possibility is a shelter for the intellect, inviting, warm and true. This is an author who is endlessly patient while pursuing his subjects, and delightfully capable of sharing his journeys with the rest of us. As a cultural historian, there can be few more determined to understand the modern human condition. Dwelling in Possibility is thus quite extraordinary in its quiet message about how we live, and certainly a triumph for this brilliant author. Howard Mansfield’s gentle polemic argues for houses that are vessels for our lives, and not just symbols of wealth. This is an enchanting and deeply intelligent book. Noun or verb, what are the qualities of dwelling? This is not a book of answers with a checklist of features for the house hunter. Instead it is a thought provoking book that dwells in our historical and cultural attitudes to home. To dwell properly “ we need to simplify. We have to restore the ordinary – the ordinary that lives in shadows, quiet, talk, the hearth.” “ What matters most can not be named”, [Mansfield] says, but with this book he has successfully teased out the qualities we desire. Is your house a good place for daydreaming? – then perhaps it has that “quality without a name” – and you do dwell in possibility. Dwelling in Possibility isn’t a guide to de-cluttering a home (though Mansfield does write about clutter), nor does it offer step-by-step instructions on how to make a place, whether private or public, feel homey. Instead, it invites the reader to dream about different houses, different lives, and different times and places. It’s a book about being, not doing. This strange and wondrous book opens unexpected doors to viewing the modern home. Mansfield takes us on an odyssey that’s part personal, part historic, and always engaging… Dwelling in Possibility is a book filled with tangents and provocations, a forum where its author can roam the corridors of his far-reaching ideas. Always he circles back to the belief that a home is much more than the sum of its amenities, a place where comfort transcends material life. Mansfield is a perceptive writer about an American sense of place, and how people pass through and how they settle down…. Mansfield is that rara avis, an eloquent master of the discursive essay.